Installation of high-value-added machinery requires a high degree of specialisation. 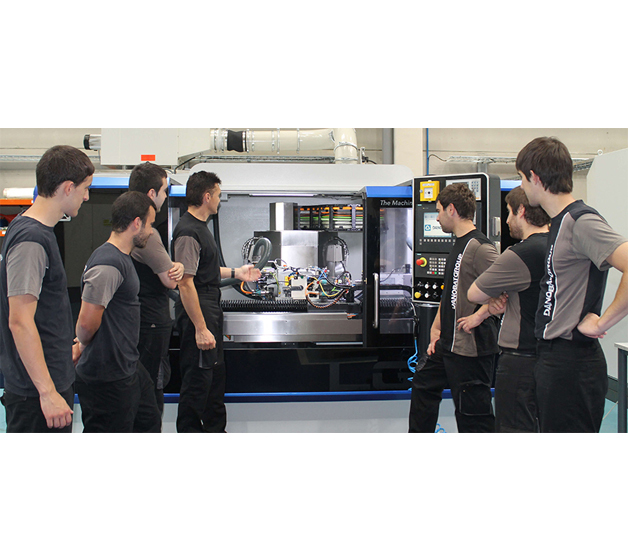 For this reason, five years ago the Basque machine tool manufacturer DANOBATGROUP set up its own educational centre where vocational training is tailored to the needs of real production environments. Since 2012, the industrial group offers Dual Vocational Training (VET), a system based on combining solid theoretical basics with experience gained in real production plants, that is developed in collaboration with the Institute of Machine Tool (IMH) of Elgoibar. Nonetheless, the company decided to take one more step in the commitment to specialised practical training with a third extra year, in addition to the normal two-year course. By doing so, the company was able to refine the model, increase the training of the students and improve the seamless integration of students in production plants. The first group of students who have completed this innovative 3-year course have been granted their Specialisation in Setting of Advanced Manufacturing Machine Tools diploma. The course is approved by the Basque Government and students enrol after completion of the Higher Level Training Cycle in Mechatronics. One of the main features of this diploma is the knowledge that students acquire in real manufacturing environments. "The importance of the company in industry drew my attention. Three years provided me the opportunity to learn more. We have worked with real materials, on real machines," says Mikel Díaz, one of the students who has just received his diploma. In his view, one of the most outstanding features of this type of training is the high degree of personal attention and the opportunity to complete theoretical knowledge with practical training. "In this third year we had tailored courses, we worked on commissioning real machines and now that I am in the workshop I have become aware that I have the knowledge of other colleagues who already have been working for some time," adds Díaz. For the student, the additional year brings a differential element in the curriculum with respect to people who do the two-year vocational training course". The HR Manager of the group, Ainhoa Fernandez, confirms that this first class of students who have obtained this specialisation certificate is "the consolidation of the commitment of the Group to invest in training of human capital". "For us, the Assemblers School Workshop is a strategic project that reflects our commitment to people and their professional projection," Fernandez explains. The Assemblers School Workshop is a key educational project for the company, which also contributes to the development of the Basque industrial fabric. Founded in 2012 and located in the facilities of the Group in Elgoibar, the school offers dual vocational training, a system that provides practical knowledge in real production environments, language training, prevention of occupational risks, stays abroad and other complementary skills that strengthen the students’ curriculum. This educational space was created following the success in Germany, where this educational system in its facilities has already been running for some time now. In order to strengthen this model, last March the firm signed an agreement with the President of the Basque Government, Iñigo Urkullu to boost Dual VET as well as to work on the creation of new specialisation professional profiles that respond to the needs of industry. This agreement is a further step forward in the existing understanding between DANOBATGROUP and the Basque institutions, which collaborate jointly in order to strengthen the links between the academic community and the labour market.